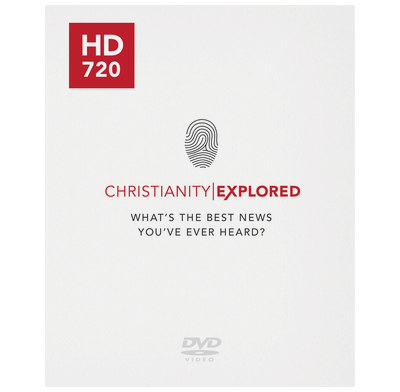 Individual episodes in HD of the award-winning DVD for this popular introduction to the Christian faith. Christianity Explored gives people time and space to discover the best news they've ever heard. Over seven interactive sessions, as they explore Mark's Gospel, people find out who Jesus is, why he came, and what it means to follow him. Written by Barry Cooper, co-writer of the original Christianity Explored course, and presented by gifted evangelist, Rico Tice, on location across the UK. These videos are encoded at HD 720p in the H264/MPEG4 format, ideal for an HD TV or projection from a laptop. Download the sample below to check that it works on your equipment. We have gone back to older edition of CE. The new edition definitely has some great cinematography but to the detriment of getting the message communicated. We use the English version with Dutch subtitles. Our small groups have commented that they are distracted by the cinematography and they find themselves watching that rather than listening to what's being said. Therefore we have reverted to the older series and have had much greater success. The episode where the walls are completely covered with all the things we've ever done is the turning point for our groups, and many people have given their lives to Christ after that episode. Please duplicate that scene again if you choose to make a 4K version. CE has been a huge tool in seeing people get saved, but for us, the older version works better. Bought as part of Prison Edition pack. Used in UK prison. Some prejudice from prisoners against perceived "Posh" people. Material well presented and clear. Handbook very useful and should be sufficiently flexible to run it according to the needs of the group that signs up. Would also be useful in other settings where a simpler approach may be beneficial. I have used Christianity Explored for a number of years and every time it brings something fresh and effective to the guests who come along. The presentations, alongside reading Mark's gospel, opens up questions and conversations that matter and enables people to encounter Jesus. Superb talks given in imaginative and creative settings the provide you with a powerful tool for presenting the gospel today. We have been using the CE DVD as part of a small group course. The material is excellent for opening up discussion, provoking thought and getting over the basic gospel message. The quality is excellent too, sound and picture, it is a great tool for use in the Christianity Explored course. I believe that Christianity Explored is a generally excellent resource, and IMHO more faithful to the gospel message (especially in its presentation of sin) than is Alpha. Which is why I was so much looking forward to the revised version. I was particularly attracted by the promise of a shorter overall format. Unhappily though, the presentation was not a patch on the original format which cleverly located each individual session in a new location appropriate to the subject matter. Both the location, AND the parallels drawn from it, helped carry the message of the original version in a very compelling way. The revised version is set in the same location throughout (presumably for time and cost savings). But frankly this just gets infinitely boring - in part because the setting itself is boring, but in even larger part because there is no visual carrier for the message. It is such a shame, because the original was so excellent in this respect. We are beginning to use these short videos in evangelistic Bible studies in our church in Japan. The class members range from teenagers to retired people. Although there is a lot to take in when one must quickly read the subtitles, we find that our Japanese class members are following along with interest. We're pleased with the way this series gives a solid overview of Mark's gospel and helps us to explain the gospel to people who often have very little knowledge of Christianity. The presentation makes it very clear that Christianity is relevant to well-educated people living in a fast-paced technologically-advanced country. It also makes it clear that our source of truth is the Bible and that it is imperative that we understand who Jesus is and what He has done for us. The presentations introduce important doctrines succinctly and leave time for discussion afterwards. We hope this series will whet the appetites of newcomers who have not read the Bible before. We are also hoping that the Christians who watch these films will be strengthened in their own faith and also be helped in their understanding of how to share the gospel. These videos are well done and the presentation is engaging. They present a clear challege to the mind and the heart--and not by sentimental manipulation. I think most people could feel comfortable inviting a friend to watch these films. I wonder if it is possible for us to get a Japanese transcription of the subtitles? I try to familiarize myself with the Japanese before each lesson to facilitate good discussion. Working through the subtitles is extremely time-consuming as I have to keep pausing the video to look up words. It would be easier if I had the text on paper. Arrived in good time. Impressed with the quality of the filming and content.using as a post Alpha 'top up', good to be focusing one one gospel. These DVDs present a clear step by step explanation of the gospel from the book of Mark. They can be used as a standalone or with the Christianity Explored Handbooks as part of the Christianity Explored Course. The course is easy to run and with some preparation you will be able to help others who are not yet Christians to hear the challenge of Christ's message for themselves. In order to provide a stimulus for evangelism as well as reminding people of the basics of the faith; we've just done CE with our entire church. The feedback has been overwhelmingly positive, with a different format (DVD) being helpful. The quality of the production (of the DVD as well as handbooks) is fantastic. The material is clear on the gospel, and helpful in allowing people to see commonly held misunderstandings. From what I remember of previous versions, the updated DVD is great. In our context (South African), I feel that we don't always follow what is still mostly aimed at an English or British audience, and so some folks haven't connected as much with the material - but it's still been immensely helpful to many. And so we're planning to run CE twice next year in the hope that regulars are confident enough in the material to suggest it to unbelieving friends and family. Christianity Explored is the best tool we have ever used for reaching guys at Joe Gibbs Racing with a clear view of the gospel!! !